At the height of the foreclosure crisis the problems experienced by some so-called “sprawl” markets, like Phoenix and San-Bernardino-Riverside, led some observers to see the largest price declines as largely confined to outer ring suburbs. Some analysts who had long been predicting (even hoping for) the demise of the suburbs skipped right over analysis to concoct theories not supported by the data. The mythology was further enhanced by the notion – never proved – that high gas prices were forcing home buyers closer to the urban core. Yet a summary of the trends over the past 18 months show only minor disparities between geographies within leading urban regions. Overall house prices escalated similarly in virtually all areas within the same metropolitan areas and the price drops appear to have also been similar. This is in contrast to a theory that suggests that huge price drops occurred in the outer suburbs while central city prices held up well. Summary of 18 Month Subarea Price Declines: This is indicated by a review of 8 metropolitan areas: Los Angeles, the San Francisco Bay Area, San Diego, Sacramento, Atlanta, Chicago, Portland and Seattle (see end note), for which subarea data is readily available (see table). On average, central area median house prices (all houses, including condominiums), fell 3% in relation to the overall metropolitan area average. 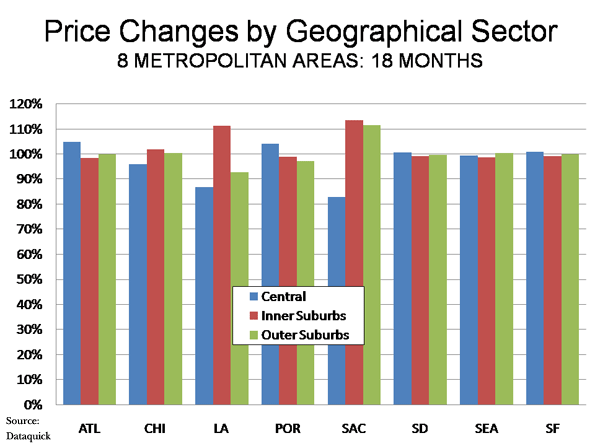 Inner suburban areas experienced a 3% gain relative to metropolitan area prices, while outer suburban areas changed at the metropolitan area average. In actual price reduction terms, core areas declined 28.8%, inner suburban areas declined 25.7%, and outer suburban areas declined 27.1%. The overall average metropolitan area decline was 27.2%. There was, however, considerable variation in the figures by metropolitan area (see figure below). Where Central Area Losses were Greatest: Over the past 18 months, central areas posted the largest losses in three of the areas. Further, in each of these areas, the smallest price drops were experienced in the inner suburbs. Sacramento had the steepest central area relative price decline. Central area prices declined 37% relative to inner suburban prices, where the smallest losses occurred. The central area price loss averaged 53.6%, compared to the overall metropolitan area loss of 44.0%. The inner suburbs experienced the smallest loss, at 36.3%. Los Angeles also had a steep central area relative price decline. Central area prices declined 45.3%, compared to the overall metropolitan area loss of 37.1%. The inner suburbs experienced the smallest loss, at 30.0% while outer suburbs lost 41.5%. Chicago’s greatest losses also occurred in the central area, but were of a much smaller magnitude. Central area prices declined 21.0%, compared to the overall metropolitan area loss of 17.8%. The inner suburbs experienced the smallest loss, at 16.3%. The outer suburbs lost 17.5%. Where Suburban Losses were the Greatest: In two areas, the central area price losses were the least, Atlanta and Portland. Yet, the magnitude of these losses was modest. It is interesting to note that the metropolitan areas with the smallest relative losses in the central areas pursued radically different policies with respect to development. Portland’s “smart growth” policies favor central development at the expense of suburban development, while Atlanta’s more liberal policies do not attempt to steer development to the core. Atlanta’s greatest price declines occurred in the inner suburbs, which experienced a loss of 17.0%, slightly more than that of the outer suburbs (15.8%). In comparison, the central area price drop was the least, at 11.6%, The metropolitan area loss was 15.8%. Portland’s greatest price declines occurred in the outer suburbs which experienced a 15.7% loss, compared to the inner suburbs, at 14.5. The lowest decline was in the central area at 10.0%. The metropolitan area loss was 13.5%. Little Difference in Some Markets: There was little difference in the price declines among geographic sectors in three of the metropolitan areas. In the San Francisco Bay area, San Diego and Seattle, the differences between central, inner suburban and outer suburban price declines were all within a 2% range. However, core area markets where condominiums predominate indicate substantial difficulties in some of the metropolitan areas. These markets are generally only a small part of central cities, principally around downtown areas or major centers. For example, in the Portland area, the core condominium areas ring the downtown area and include the Pearl District and the South Waterfront District. The central area, which encompasses the entire city of Portland, however, is much larger and has a much larger share of detached housing. Demand has been so weak in the core condominium markets that substantial price reductions have occurred and a number of buildings have been forced to sell units at auction. Other buildings have given up altogether on selling and have rented condominiums. Some of the price drops, especially in Atlanta, Portland and Seattle are far greater than occurred overall in the respective metropolitan markets. The condominium implosion has not received nearly the level of attention in the national or local media that was accorded the housing bubble and collapse itself. Portland: A local television station video indicates that Portland’s condominium market is in crisis. A report in The Oregonian indicates that the downtown area has a “glut” of condominiums and that February sales prices averaged 30% below list. A luxury new 15-story building in the Pearl District (The Wyatt) is now being leased instead. Units at The Atwater in the South Waterfront district were auctioned, with minimum bid prices more than 50% lower than list. The John Ross, also in the South Waterfront District, is Portland’s largest condominium project and will be auctioning its units. Minimum bid prices average 70% below the previous top list prices. The smallest units have a minimum bid price of $110,000. By comparison, over the past year, the median house price in the Portland metropolitan area has dropped approximately 10%. Atlanta: Atlanta has a “vast oversupply” of condominiums. The uptown (including Atlantic Station) and Buckhead markets of Atlanta appear to be experiencing some of the worst market conditions in the nation. 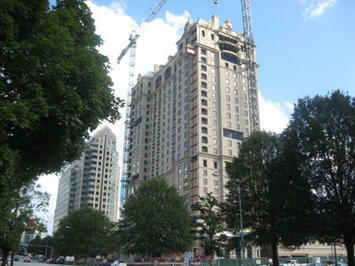 The prestigious Mansion on Peachtree, a combination hotel and condominium development, was unable to sell 75% of its residences and was recently sold in foreclosure at approximately $0.30 on the dollar. The winning auction bids at The Aqua condominium in Uptown averaged 50% below the last asking price. In Atlantic Station, units at The Element were auctioned at substantial discounts. Among conventional sales, condominium price reductions of up to 40% have been reported. One building has offered discounts of $100,000 per bedroom. Some new buildings have been converted to rentals, while planned projects have been placed upon hold. Seattle: Things are little better in Seattle. The overbuilt downtown area condominium market has experienced a median price decline of 35% over the past year. Units at The Gallery in tony Belltown were auctioned off at minimum prices 50% below the last list prices (which had already been discounted). Units at The Brix, on Capitol Hill, attracted bids at auction averaging 30% below previous list prices. Later this month, unsold units at 5th & Madison will be auctioned, at minimum prices below 50% of previous list. For comparison, median house prices in the Seattle metropolitan area declined 6% over the past year. Chicago: The downtown area of Chicago has been among the most vibrant condominium markets for more than a decade. However, in 2009, condominium sales fell to the lowest level since 1997. At current sales rates, the downtown area has a supply of more than five years, with annual sales of less than 600 and more than 3,000 units available or under construction. Los Angeles: Few markets have seen as many condominium buildings planned as downtown Los Angeles, and few have seen so many put on hold. A recent issue of the Los Angeles Downtown News lists approximately 50 downtown condominium projects. More than three-quarters of the projects have been scaled back, have had construction slowed or are on “hold.” The market has been so weak that a number of developers have taken losses by auctioning condominium units that they have not been able to sell conventionally. San Diego: The downtown San Diego condominium is substantially overbuilt. Developers have leased units that were to have been sold and there is virtually no construction of new units. Rental Conversions: Even these grim reports, however, may mask an even bigger problem. It is estimated that more than 20,000 condominiums units are completed or nearly completed, but are not listed for sale in Miami. In what is by far the nation’s strongest condominium market, Manhattan, more than 6,000 condominium units are completed or nearly completed, but not listed for sale. In core cities, few issues have been as divisive as the conversion of rental units to condominiums. But, now the opposite is now occurring – condominiums are being converted into apartments for rent: This is trend that undermines markets in a way that cannot be measured by median prices, since it replaces generally high-paying condo owners for generally less flush renters. This puts those who bought at higher prices in these markets at a particular disadvantage. Conclusion: Overall, contrary to the mythology developed early in the bubble, suburbs and even exurbs have generally performed about as well as closer in markets. The big imponderable will be the future of the core condominium market, which is experiencing significant financial reverses largely ignored by the national media. Note: As used in this article, the Los Angeles metropolitan area is the Los Angeles-Riverside Combined Statistical Area, the San Francisco area is the San Francisco-San Jose Combined Statistical Area and all other metropolitan areas are the corresponding metropolitan statistical areas. http://demographia.com/db-prdistr2010.pdf>Subareas defined. Photograph: Condominium construction, Atlanta, weekend of the Lehman Brothers collapse. Submitted by xygwfl1122 on Wed, 01/21/2015 - 06:41. Submitted by xygwfl1122 on Mon, 01/19/2015 - 06:15. Submitted by uofix on Sat, 09/06/2014 - 05:30. Submitted by tsflw on Tue, 08/05/2014 - 05:37. Submitted by zion1122 on Thu, 08/29/2013 - 05:46. Submitted by robert1122 on Wed, 08/28/2013 - 05:50. Submitted by zion1122 on Tue, 08/27/2013 - 02:34. Submitted by zion1122 on Wed, 08/21/2013 - 09:38. Submitted by zion1122 on Wed, 08/21/2013 - 05:29. Submitted by zion1122 on Tue, 08/20/2013 - 08:39.